The constellations of satellites orbiting our planet enable high-precision positioning not just for consumer or survey applications but also for geoscience research such as detecting plate motions, landslide movement, or other changes on the Earth's surface. 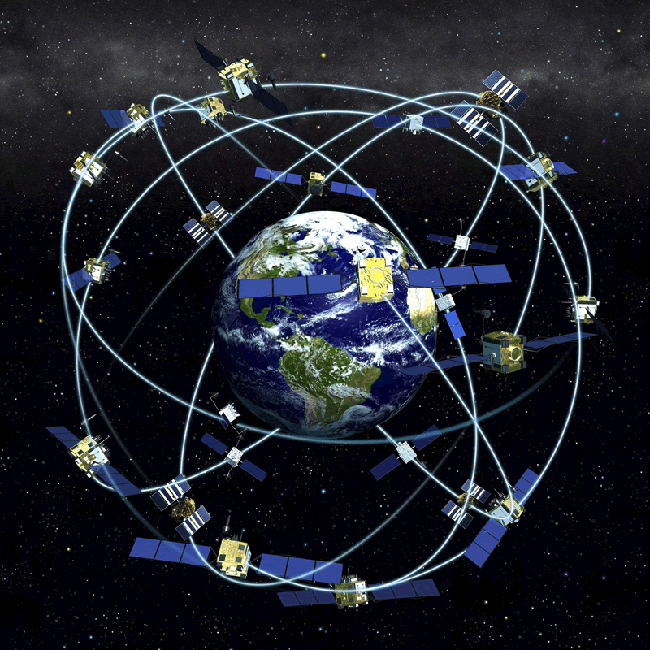 This unit introduces students to the fundamentals of these global navigation satellite systems (GNSS), the reference frames used for positioning, and the different acquisition techniques, including their merits and accuracy. Through classroom and field activities, students develop a familiarity with the variety of instrumentation and applications available with GNSS. This unit provides a broad conceptual understanding of GNSS applicable to all acquisition techniques. Subsequent units focus on kinematic and static methods and the different products generated using those GNSS methods. Articulate how GNSS satellites enable the positioning of objects relative to local or global reference frames. Justify which GNSS tools and techniques are most appropriate for a particular scientific question. Distinguish between the accuracy and precision possible using different GNSS hardware and software. List and describe the sources of uncertainty in GNSS measurements. Complete a conceptual diagram of a GNSS system and the related parts. Recognize and articulate how GNSS-assisted research provides a societal benefit. Cognitive: Developing student understanding of GNSS fundamentals and applying these to the design and implementation of a basic GNSS survey. Behavioral: Train students to set up a basic GNSS base station, selecting the appropriate techniques for a given science question. Affective: Discuss the application of GNSS at sites with societal impact. Discuss the capability to resolve changes that were previously unmeasurable. This introductory unit is appropriate for upper-division geoscience, earth science, geography, or civil/environmental engineering students who have already been introduced to basic concepts such as plate tectonics, mass movements, and hydrology. Students should also have a first-order familiarity with uncertainty, precision, and accuracy. It also helps if they have familiarity with spreadsheets (ex. Excel or Google Sheets). The unit is appropriate for academic year courses with field components or a summer field camp. This unit includes a mixture of classroom and field-based learning and should require ~3–5 hours of contact time. This unit should be taught before all other units in this module unless the students already have a strong understanding of GNSS and related applications. This module begins with an introductory lecture and discussion on GNSS and a few case studies. The lecture and discussion is supported by a PowerPoint presentation (linked below), which introduces the fundamentals of geodesy and GPS/GNSS positioning. The purpose of the lecture is to promote thinking about how and why GPS/GNSS is used in science. It includes potential think-pair-share style interactions based on societal implications of GNSS data. This lecture and discussion is intended to take around an hour and 15 minutes. In the Accuracy, Precision and Error exercise (linked below), students compare the variability in positions collected by several different GPS/GNSS devices, at a fixed interval (e.g. 10 seconds), over a short duration (15 minutes), at a common point. For instance, if there is a known benchmark nearby, students can visit it and record a series of locations using familiar devices such as phones, tablets, handheld GPS, or mapping-grade instruments. More advanced GNSS can be used if the students already know how. Students then use a shared spreadsheet (ex. Google Sheets) to input their data and share it with others. Prepared data are also available if your class cannot collect their own. The final analysis involves students individually calculating the accuracy and precision of each instrument and answering a series of quantitative and qualitative questions. Field work takes ~45 minutes and analysis takes ~60 minutes. 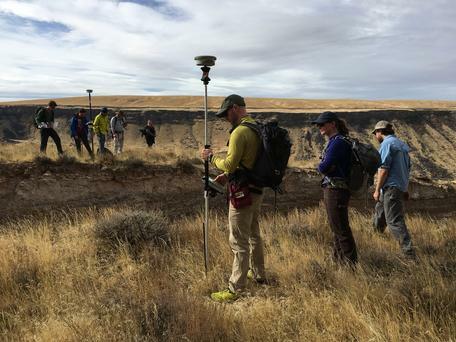 Students learn kinematic GPS/GNSS surveying at the Salmon Falls Landslide site in Idaho. The instructor guides students through the assembly of a GNSS survey system in a field deployment scenario. Students take notes, but there is no explicit deliverable or exercise for this activity. This could be for either a static base or a RTK rover. It is not important to go far from the classroom for this. The setup should illustrate a variety of hardware characteristics (antenna, receiver, controller, power, etc.) and site considerations (e.g. obstructions, baseline distance, multipath , monumentation, security/permissions, etc. ), reinforcing the ideas discussed in the lecture. Small groups of less than six work best, so multiple stations or rotating activities may be necessary for larger classes. The content from this activity will be synthesized into the concept sketch below. This should take ~45 minutes. A short field activity that helps students apply accuracy, precision, and error to GNSS positioning using multiple grades of positioning instruments. If different student groups are adding different pieces of the data, you may want to convert this to an online spreadsheet (ex. Google Sheets) so everyone in the class can access a single file. Prepared data worksheet with ~300 contemporaneous positions from four devices. Instructor resource showing plots from the Accuracy, Precision and Error prepared dataset. Assessment of student understanding of the basics of a GNSS system through a diagrammatic illustration. An initial guide for GNSS surveys. This covers the merits of various campaign types, data collection and processing, physical equipment setups, and monument logs. This can be given to students in the introduction so that they understand the depth of the material, take notes as necessary, and reference it when necessary. Alternatively or in conjunction, you may supply the manual specific to the survey type you will use in more depth later in your course. Supplementary guide that illustrates basic elements and techniques of GNSS system mounts. Optional depending on equipment and methods used. Supplementary guide that illustrates setup of a spike mount, a campaign GNSS mount favored by UNAVCO. Optional depending on equipment and methods used. For general suggestions on how to implement the module, see Module Overview: Making the Module Work. This unit requires demonstration of high-precision GNSS hardware. For Unit 1, we suggest one base station and/or one rover for the setup demonstration. All hardware should come from the same manufacturer for ease of instruction and data processing. Always have your hardware fully charged, professionally serviced, and recently field tested before using it with students. In-class hardware or software malfunctions are distracting and frustrating. If your school does not have kinematic GNSS equipment, you may be able to find colleagues who do or consider requesting support from UNAVCO, which runs NSF's Geodetic Facility. Because this unit conveys broader, conceptual topics in GNSS that are more typically conveyed during a full semester course, it is important to remind students that they are just brushing the surface. This unit provides the minimal foundation necessary for students to apply GNSS tools in solving field-based questions about quantifying deformation at the Earth's surface. As such, this unit focuses on the application of the tools and will skip much of the theory and physics that would be obtained from a course on geodesy. It is ideal for instructors to have previously collected high precision coordinates for the monument. The monument should be easy to access and does not need to be significant for any purpose other than this assignment. Coordinates should be obtained using a variety of GNSS techniques with varying precision and accuracy, but even identical instruments will return inconsistent positions. Exporting the data off multiple devices, moving it to the community sheet and transforming it to a projected coordinate systems is a non-trivial task. It is good to practice this before asking the students to do it. It is important for the outcome of this exercise to collect simultaneous time-interval positions with multiple devices, so that they may be compared. This can be done on consumer/recreational and mapping-grade devices by using the "track" feature that records a position every 'x' minutes or seconds. Many of those features have settings that require a threshold movement distance before a new position can be collected. Be sure to disable this and know other equipment-specific settings beforehand. This unit includes one introductory worksheet, Accuracy, Precision, and Error. The worksheet is graded for correctness and is largely quantitative. Much of the formative assessment can be done through observations of and discussions with students individually, in pairs, or periodically in the whole group. The summative assessment for Unit 1 requires students to draw a concept sketch of a GNSS technique applied to a designated field problem. The concept sketch is graded based on both the completeness of hardware components and student comprehension of how GNSS systems work and the environmental concerns associated with the setup. The students should demonstrate that they understand the difference between static versus kinematic GNSS techniques, their appropriateness for different applications, and how the data benefits society. It should contain enough information to illustrate a complete understanding of the systems and highlight any opportunity for clarification in the student's understanding before moving to more complex ideas in Unit 2 or Unit 3. For more on concept sketches, see Resources or student examples below. Student examples here are generally exemplary and display appropriate progress for the unit.